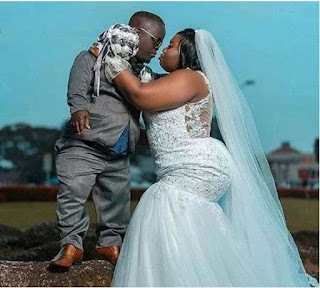 A dwarf man and his lovely, endowed wife have been making waves on the Internet since the release of their wedding photo. The viral photo shows the couple in their wedding attire, gazing into each other's eyes with what must be love. Social media users have found the thrilling photo inspiring at best and touching at worst. As they say, there is someone for everybody out there.